We are all cognitively biased. And, if you fail to see this, you are suffering blind-spot bias. While we would all love to view ourselves as implicitly rational, we are often not. Cognitive bias explains much of the irrationality in how we make decisions, think and behave. You may view yourself as somewhat immune, given your above average intelligence, but even this is an example of cognitive bias—overconfidence. People have a tendency to notice cognitive and motivational biases far more in others than themselves. Those who wish to ignore their cognitive bias are likely suffering from the ostrich effect. Cognitive bias is the irrationality in all of us—from our leaders to the average and not so average people, and you. The best thing to do is to STEP over your confirmation bias and accept the irrationality. Cognitive bias explains a great deal about why we, our leaders, customers and others sometimes do the irrational and even seemingly stupid. With a road map under your belt to help spot and even plan for cognitive bias, in conjunction with your rational, creative and ever learning and iterating strategic frameworks, progress is likely inevitable. Likely there is a bias waiting to push you in the wrong direction. 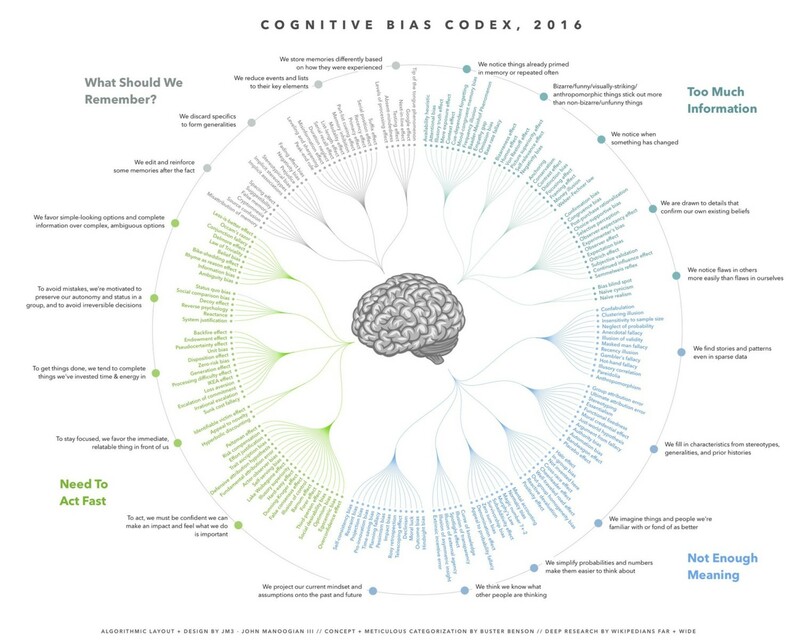 Access the Cognitive Bias Codex 2016 here!